For years, Bjango, previously known as iSlayer, has made a handful of wildly popular Mac widgets and apps, and bizarrely released them all this time as donationware. For the first time, the company is stepping into the realm of commercial software, and rightly so. Thursday afternoon, Bjango released iStat Menus 3.0, a major upgrade to its system monitoring utility. For a couple years now, iStat Menus has been a go-to utility for inquisitive minds and power users who want to keep an eye on various aspects of their Macs performance. 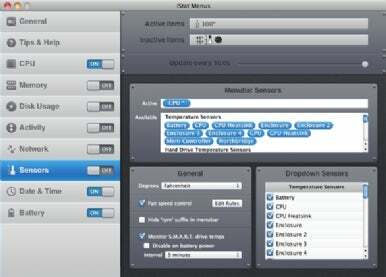 It provides a series of customizable menubar widgets that display everything from CPU load, to free disk space, to network activity, and even sensor monitoring of fan speeds, hard drive temperatures, voltage, and much more. iStat Menus 3 features a slew of changes, not the least of which are a new battery item and fan speed control on supported Macs. Like TextExpander 3, the new iStat Menus transcended its previous state as a System Preferences pane to become a dedicated app. You can view Bjango’s complete changelog for the rest of the updates. Since Bjango’s apps and widgets are of such high quality and utility, users have long told the company that it should charge for its wares—so Bjango is finally making the move. iStat Menus 3 is now a commercial app, and in celebration of the launch, it’s on sale for $10. It requires at least Mac OS X 10.5 Leopard, and a free demo is available.